BIO-CLEAN: An Environmentally Friendly Bacteria Waste Eliminator With The Most Powerful Concentrated Enzyme On The Market Your Pipes Are Spotless and Odour-Free! Clears hair, food particles, paper and cotton from drains. These are tough to clear from drains – other products can be toxic to you, and the environment, risk damaging your pipes and/or fittings or simply not work as effectively – clearing MOST of the obstruction, but not eliminating it completely. Eliminates foul drain and garbage disposal odours. 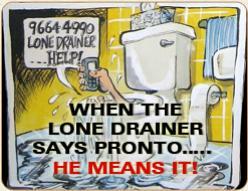 Often, clearing the drain solves half the problem. The residual odours can in fact be WORSE once the drain is unclogged because of the increase in air flow. Eliminates odours in cat litter trays. This is a unique use of BIO-CLEAN much appreciated by cat lovers! Helps maintain septic tanks odour free. Septic tanks can build up gases and unpleasant odours. 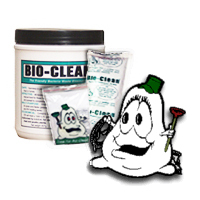 BIO-CLEAN reduces and often eliminates them quickly and effectively.